When you think of buying an action camera, GoPro is the brand that comes in your mind first. However, most GoPro cameras are pretty expensive with $200 dollars being the cheapest model. You really don’t have to spend that kind of money in order to get action cameras that are just as good and that are going to provide you with a comparable performance. There are plenty of action cameras on the market that can compete with the GoPro action camera. GoPro itself is constantly developing and moving forward, and the entire industry is moving right along with it. This means that plenty of other manufacturers are rising to the challenge, giving you a very broad selection of great and inexpensive GoPro alternatives that offer fantastic footage. These are the action cameras that you want, and they’re the action cameras that you deserve to have at reasonable rates. Below we have listed and reviewed the best cameras like GoPro but cheaper. 1. Video Quality - This is the most important thing that you need to take into consideration when buying an action camera. The higher the resolution the better the video quality gets. Currently 4K is the highest resolution you can get from an action camera. But in most cases 1080p or even 720p is good enough. 2. Image Quality - If you are going to use the camera for taking still pictures as well as videos, then you need to consider the image quality of the camera. In this case the higher the megapixel the better image quality you can expect. But as they are intended for video, don't expect the image quality to be great. 3. Battery Life - You don't want your action camera to die on you just after a few moments of using it. An ideal action camera should be able to last at least 2 to 3 hours with a single charge. You also need to keep in mind that shooting in higher resolution will result in a faster battery drainage. If you are going to be out all day shooting videos, you should probably buy an extra battery or a portable power bank. 4. Durability - Another important aspect is how durable the camera is. Is it waterproof or weatherproof? 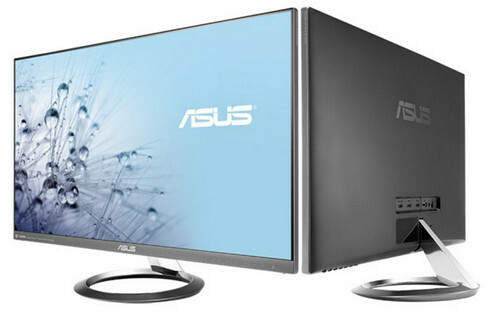 Does it need an external casing to make it waterproof? For instance the GoPro HERO Session is waterproof up-to 33 feet without any casing. Comes with a spare battery that can be easily swapped when needed. 4K Video Support at 25 FPS. Waterproof upto 100 feet with the case provided. If you want to record things in extreme environments with 4K but don't want to break the bank then you should get the AKASO EK7000. It can reach a depth of 100 feet using the free case provided. Whether you’re surfing, swimming, or drifting, this is one of the best choices on the market. 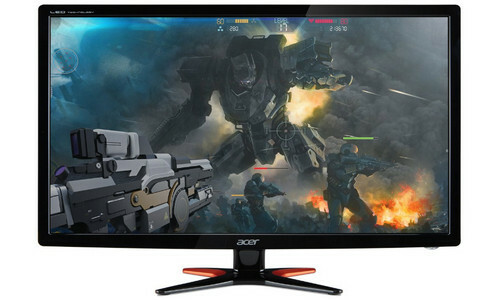 The AKASO EK7000 literally has two times the resolution of most HD cameras that are under 100 dollars. If you want to document your snorkeling journey, few devices are as good as this one. The wide-angle lens makes it easy to capture most of your surroundings. The image quality that you can expect with this device is excellent, and it’s something that you’ll be able to appreciate with all of your footage. 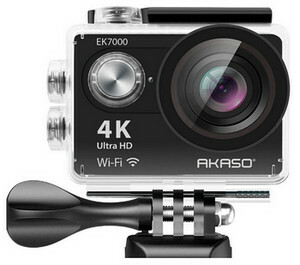 The AKASO EK7000 4K WIFI Sports Action Camera Ultra HD Waterproof DV Camcorder has more battery life than most of its competitors. It also has two rechargeable batteries. You’ll get ninety minutes of recording with each and every battery when it’s fully charged. Recharging the batteries won’t take very long, and you can get back to creating some really great footage. 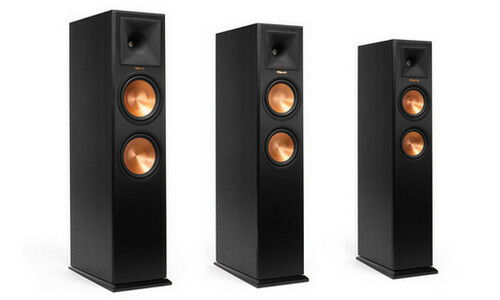 To make matters even better, the AKASO EK7000 is also very easy for people to set up and to put together. You’ll have it ready in no time flat. 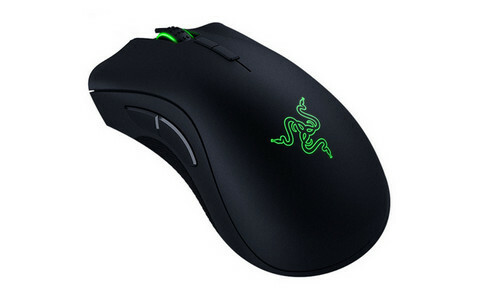 The AKASO EK7000 also stands out in terms of its accessories. This is a device that has a waterproof case, lens cloth, USB cable, clip, bandages, helmet mounts, bicycle stand, tethers, protective backdoor, mount, and manual. You can get everything that you need with an action camera like this one, and you’ll ultimately get so much more in the bargain. One of the smallest action camera with WiFi that you can buy. 8 Mega pixel CMOS sensor to capture vibrant images. 124 Degree wide angel lens to capture most of your surroundings. Can mount magnetically on any metal surface. Polaroid is the first brand that put started to compete with GoPro with a cheaper price tag and good quality. Also If you care what your action camera looks like, then this one is going to be even more appealing. 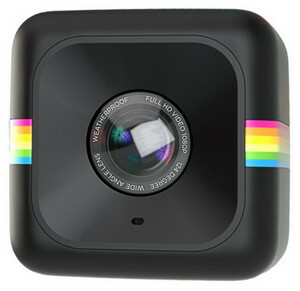 It has to be one of the most adorable little action cameras on the market today. It is also going to be significantly easier to carry as a result of that, of course. 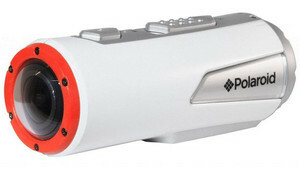 Action cameras need to be discrete and easy to carry, and this one qualifies. This tiny little camera literally weighs a quarter of a pound. You’ll barely notice that it’s there. You’ll get a 124-degree wide-angle lens with this camera. 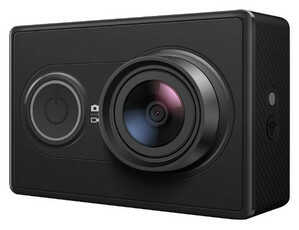 The Polaroid Cube+ 1440p Lifestyle Action Video Camera doesn’t look like it would be good for filming really broad scenes, but it is. It’s proof that impressive capabilities can come in small packages. Thanks to the 8MP CMOS sensor, people can expect really clear and sharp images with this device. The video quality and sound quality of the device should be up to your standards and beyond. 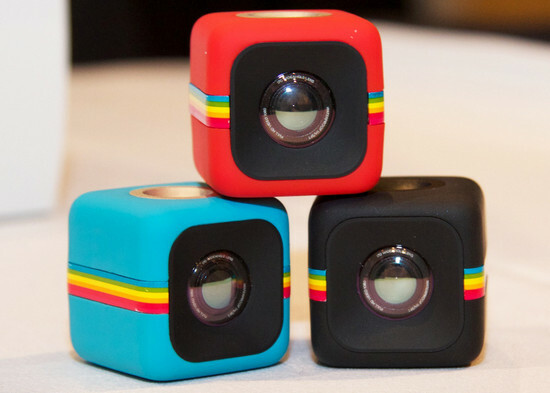 You can also get great still images with the Polaroid Cube+. The rechargeable battery is built-in, and it should manage to hold a charge easily. You should be able to record a good solid ninety minutes for each charge. You can mount the device with a clip, or you can mount it magnetically. Either way, you should be able to easily accomplish what you need with a device like this one. It gives a lot and it doesn’t require a lot of anyone at all. Aerodynamic design for less air drag. Waterproof upto 30 feet without any casing. The Polaroid XS100 Extreme Edition HD 1080p 16MP Waterproof Sports Action Video Camera meets many of the needs of action camera users. The sensor for this device works very well even under many low-light conditions. As such, you’re going to have more choices when it comes to what you can film. Coupled with the fact that this is a device that is waterproof to a depth of around 30’/10m, you will be able to get some really great action shots deep in the water. At a third of a pound, this is a device that is not going to be difficult to transport or to handle during any part of the filming process. The design for the Polaroid XS100 Extreme Edition HD 1080p 16MP Waterproof Sports Action Video Camera is wonderfully aerodynamic, which is just going to make it that much easier for you to film under situations where air drag is a thing. For example if you want to mount your action camera on your motorcycle helmet, then this is a great choice. The exterior of the camera is shock-resistant. The camera was designed to reduce wind noise as well, which should only make it that much easier for you to get the footage that you want. You’ll get around two hours of recording time with a battery, which is definitely above average in this niche. You can spice up your footage with both slow and fast motion shots in HD and otherwise, thus giving you significantly more options when it comes to how you film what you film. You’ll get handlebar mounts and helmet mounts in the package with the Polaroid XS100 Extreme Edition HD 1080p 16MP Waterproof Sports Action Video Camera. It only takes a single click of a button to get you to record what it is that you need in order to get your action shots and action videos, and that should be enough. 155 degree wide angle lens. Both Bluetooth and WiFi connectivity. The YI 88001 16MP Action Camera with High-Resolution WiFi and Bluetooth, Black is truly a sleek and stylish action camera. It’s a small camera at around a third of a pound. While it’s a portable camera, its quality is still going to be comparable to the cameras that are much larger. You’ll really be able to get footage from a long distance away. The software also enables you to perform a continuous recording loop, so you can really get the footage that you want. The device is capable of operating on less power compared to many of the other devices on the market today. It was designed in order to manage its battery power more effectively, and that is only going to make it easier for you to get the footage that you need. The device is capable of Wi-Fi connectivity up to 300 ft and is also capable of being connected with Bluetooth 4.0. You can truly stay connected with your other devices and with this one. The interface works very well. You’re going to drop an action camera every now and then. It’s important for an action camera to be able to stand up to all of that, and the YI 88001 16MP Action Camera with High-Resolution WiFi and Bluetooth is capable of that. While you shouldn’t toss it around for fun, it’s still a tough camera that is going to stand up to a lot of different problems. The device comes with two rechargeable batteries. You’ll get some great results with the YI 88001 16MP Action Camera with High-Resolution WiFi and Bluetooth, Black. This is a device tough enough and good enough to make everything work. 2 inch LCD screen to view images and videos in real time. Comes with a spare battery that you can swap anytime. 170 degree wide angle lens. The DBPOWER EX5000 14MP Waterproof WIFI 1080P FHD Action Camera really allows you to take some fantastic videos. It was designed to eliminate some of the problems that you might normally experience when it comes to action cameras. It was designed with an anti-shaking function, for instance. The shaking that you’re naturally going to do when you’re filming with an action camera won’t be there. As a result, you can expect clearer and more stable footage. 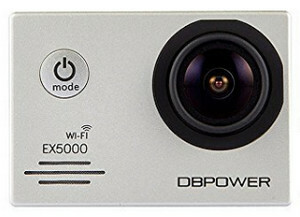 The DBPOWER EX5000 14MP Waterproof WIFI 1080P FHD Action Camera actually does have built-in Wi-Fi, which is going to make it much easier to use in many cases and which will make it more versatile. The 170° wide angle lens will give you the opportunity to really get footage of expansive landscapes. This is a device that really takes good pictures as well as great videos. You can really feel as if you’re captured enough of your surroundings in the process. You can expect to have a really great battery life with the DBPOWER EX5000 14MP Waterproof WIFI 1080P FHD Action Camera. The package alone has two rechargeable batteries. This device is also much better in terms of memory storage than many of the others on the market today. In 720p, you can get eight hours of video. In 1080p, you can get five hours of video. Regardless of what it is that you’re trying to film, you should have the space for it on a device like this one. You aren’t going to suddenly run out of space because you were trying to film something really great and you lost track of time. This is an action camera that understands the needs of people who use action cameras on a regular basis. GoPro alternatives are everywhere in the media today. Action cameras are popular. You don’t want your exciting experiences to go unnoticed by the world. You also should not have to spend a lot of money in order to make that happen. With the cameras similar to GoPro that are on the market today, that isn’t going to be a problem for you. That is why in this post I listed the best cameras like GoPro but cheaper. Some of these devices are even better than the GoPro action cameras that are just significantly more expensive. However, almost all of them can offer great battery life, fantastic video quality, and a number of other qualities that demonstrate the needs and wants of action camera users.